We are proud to exhibit this rare 2,500 year-old bronze figure of a tapir that miraculously survived a turbulent period of ancient Chinese history. The tapir is a pig-like mammal now classified as an endangered species. This bronze figure of a tapir, exquisitely inlaid with gold and turquoise, is just 10ins tall and 17ins long and was made in about the 4th century BC as a wine vessel. A lid with a ring on its back can be removed to fill the interior with wine that is then poured out through the mouth. The figure was produced for a wealthy and powerful man. 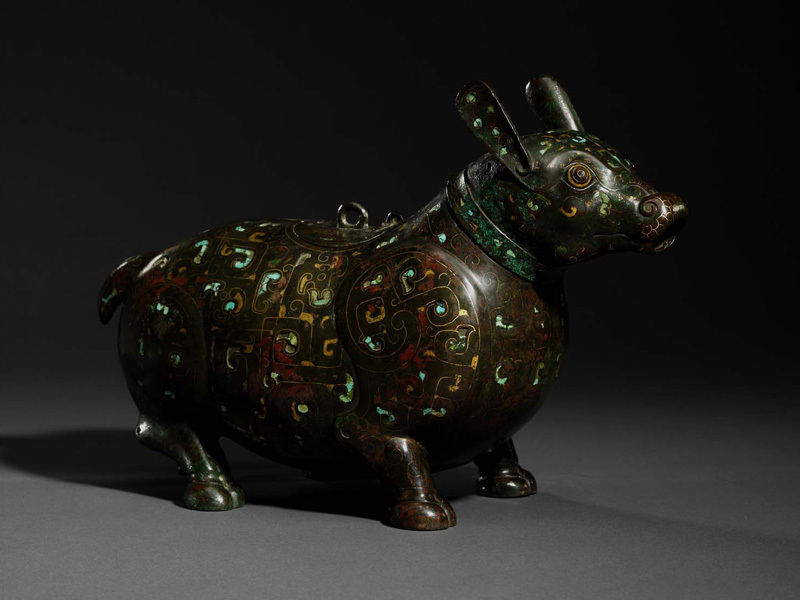 It is inlaid with spiral motifs of gold and turquoise, which would have been extremely expensive, and is also portrays a creature which became extinct in China about 10,000 years ago, long before the zun or wine pourer was made. It is known that Chinese rulers collected rare animals from overseas and the endearingly rotund and gentle tapir, which then, as now, came from Malaysia, would have been the perfect addition to a private zoo. This one appears to be wearing a decorative collar and may have been a royal pet. The figure’s survival is miraculous. It was made during the Warring States period in China, which lasted from the 5th century BC until the unification of the country by the Qin Dynasty in 221BC. It was an era of chaos and brutality when regional warlords annexed smaller states around them and competed for supremacy with one another. The tapir is one of only two bronzes with such extensive and beautiful inlay known to exist, the other being in a museum in Taiwan. All that is known about the tapir’s history is that it was in a European private collection by the 1920’s and was exhibited in Berlin in 1929.